Settling native land claims is ostensibly supposed to bring some certainty to land-use questions in B.C. But two recent decisions by the provincial government are creating even more uncertainty for mining and mineral exploration in B.C. and sending a negative signal to the international investment community, says the Association for Mineral Exploration BC (AME BC). In recent months, mineral claims in B.C. have been put into question as a result of interim treaty agreements. In January, a junior mining company owned by Chinese investors launched a legal challenge of what it alleges was a secret deal to hand over to the Kaska Dena First Nation, as part of an interim treaty agreement, land on which the company has mineral claims. China Minerals Mining Corp. (TSX-V:CMV) and its subsidiary, Cassiar Gold Corp., say the deal is tantamount to expropriation without compensation, since the Kaska Dena have their own development plans – a run-of-river hydro project – that overlap and could be incompatible with mine development. It has been speculated that the China Minerals dispute could end up being the first case to trigger a dispute mechanism between Chinese investors and Canada under the Foreign Investment Promotion and Protection Agreement. John Rustad, minister of aboriginal relations and reconciliation, said the transfer of land from the province to the Kaska Dena does not change the company’s rights with respect to its mineral claims. Under the Mineral Tenure Act, the rules are different for Crown and private land, said Robin Junger, who specializes in aboriginal law with McMillan LLP. “The private land regime set out in the Mineral Tenure Act is different and more onerous, and it does not allow all forms of development everywhere without consent,” Junger said. An even bigger question mark for mineral exploration now hangs over a vast area of the Chilcotin region. In mid-February, the B.C. government signed a five-year agreement with the Tsilhqot’in First Nation called the Nenqay Deni Accord. Under that agreement, some Crown land is expected to be transferred to the Tsilhqot’in. That’s over and above what the Tsilhqot’in already received as a result of the 2014 William case, in which the Supreme Court of Canada acknowledged Tsilhqot’in title over about 1,750 square kilometres – 2% of the area it claimed. The Nenqay Deni Accord covers a vast area, twice the size of Vancouver Island. AME BC estimates 7,850 square kilometres of the area are held as mineral tenure or placer title. For companies with mineral claims in the area, the concern is that no one knows which lands might eventually be transferred to the Tsilhqot’in. The accord identifies two types of land: Category A and Category B. Category A land is Crown land that would be transferred to the First Nation. Junger said the agreement creates considerable uncertainty for mining and exploration. Despite having implications for mineral claims, the agreements have been negotiated without involving companies that may have mineral rights in the area, Dirom said. 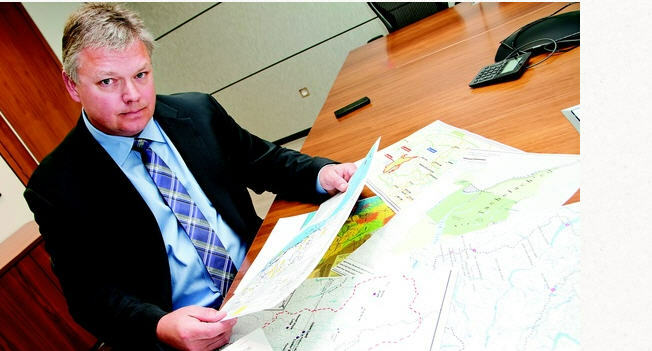 Another case that may bring uncertainty to the mining sector is a land title claim on the Ajax mine property near Kamloops. Last year, the Skeetchestn and Tk’emlúps te Secwepemc First Nations filed a title claim in the Kamloops area. That claim differs in a very significant way from the landmark William case, in which the Supreme Court of Canada granted collective ownership of 1,750 square kilometres of Crown land southwest of Williams Lake to the Tsilhqot’in. In fighting that case, the Tsilhqot’in deliberately excluded private land from the claim. They undertook a comprehensive survey of all private parcels of land in the claim area and deleted them. Only Crown land was claimed. Experts in aboriginal title law said the case only postponed the inevitable. At some point, governments and courts would have to confront a very difficult question: how will they deal with an aboriginal title claim on private land? That question is now before the BC Supreme Court. Unlike the Tsilhqot’in, the Skeetchestn and Tk’emlúps te Secwepemc are laying claim to an area that contains private land, including the property where the Polish mining company KGHM plans to develop the Ajax copper-gold mine. The government is opposing the title claim.